THQ announced on Friday that they are bringing their immensely popular uDraw GameTablet to HD game consoles this November. The innovative gaming tablet drawing device which launched last fall for Wii has shipped 1.7 million units to retailers worldwide the company announced. Unlike the Wii version which required a Wii Remote to snap into the device, the Xbox 360 and PS3 versions will incorporate console controls directly into the uDraw GameTablet. 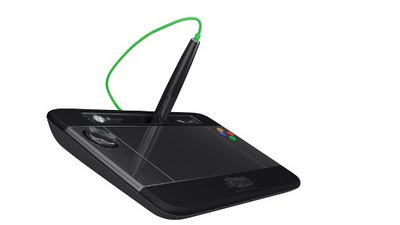 Featuring a sleek new black finish, the new tablet has enhanced capabilities including high-definition art creation, a stylus with with greater sensitivity for more precise results, longer drawing times, plus direct touch-screen controls that incorporate pinch-and-stretch and rotation features. The Xbox 360 and PS3 versions of the uDraw GameTablet is capable of producing enhanced high-definition output at 2000 x 1600 resolution. Like the Wii version, these new tablets will also feature wireless control. While the Wii tablet featured a white finish and a more clunky form factor aimed at kids and families, the new Xbox 360 and PS3 versions with their contemporary black finish and enhanced precision seems aimed at intermediate and advanced artists. Bundled with the uDraw GameTablet will be a new version of uDraw Studio, called uDraw Studio: Instant Artist, and offers expanded guided tutorials covering the basics of art and design, as well as a redesigned interface that keeps the art tools on-screen at all times. This enhanced version also allows artists to more easily send and share their creations online. Brand new video games compatible with the uDraw GameTablet are expected to be out before the end of the year for all consoles. An updated version of Pictionary, called Pictionary: Ultimate Edition, is coming out for Xbox 360 and PS3 and will feature enhanced graphics, new clues and new functionality. For the Wii, Nickelodeon and DreamWorks Animation's The Penguins of Madagascar will bring the quirky brand of humour to the uDraw GameTablet. These titles join a growing list of uDraw GameTablet games already available including SpongeBob SquigglePants, Kung Fu Panda 2, Dood's Big Adventure and the original Pictionary ﻿. THQ says it plans to continue to support the uDraw GameTablet with new software throughout 2011 and 2012. For more information on the uDraw GameTablet check out THQ's official homepage for the device at www.worldofudraw.com.